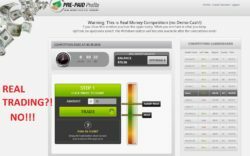 In this review of „PrePaid Profits“ we prove that it is a binary options scam that will lose your money. 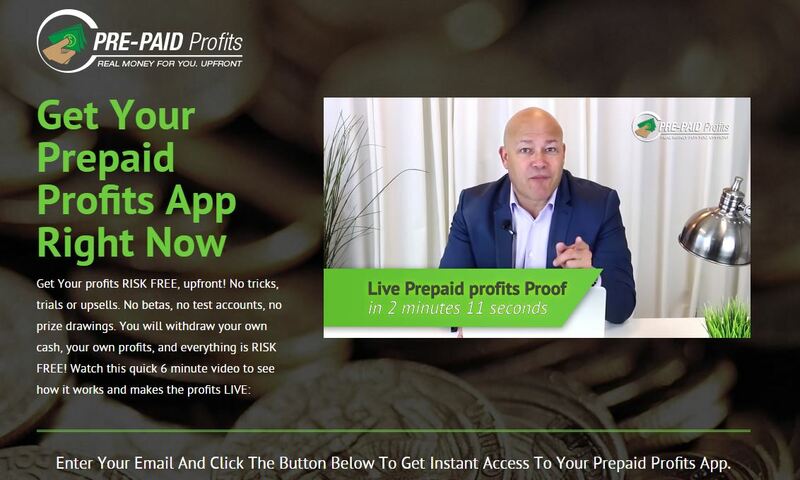 In the Pre-Paid Profits presentation you can hear that this program will give you free withdrawable profits at the end of a contest. You will allegedly get a real balance to withdraw. Prepaid Profits is a total scam based on an app that must make laugh anybody who knows something about binary options trading. But because not everybody knows binary trading, we had to make this review. When you sign up for Prepaid Profits, you are sent to a page where you have to just click on a single button. Then some allegedly live trades take place with real money. But it is just a game with fake money! This has nothing to do with real trading. First of all you don’t even see the asset that the trades are placed upon. Then you don’t see any price. It is just a stupid game like with the One Click Profits scam. If it was not a scam, we would really have a good laugh. 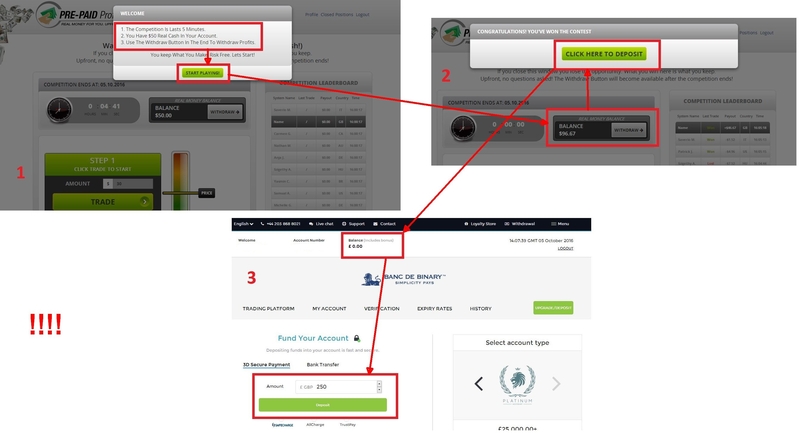 Because all the time that you play with Pre-Paid Profits you are told that it is real money that you can withdraw. But what happens when you try to withdraw? You are told that you have to deposit and you are redirected to Banc de Binary. Where, by the way, you can see that the real balance on the trading account that they opened for you is zero. See the proof on the image. Seriously, you click on withdraw and you are asked to deposit money… Scammers are really incredibly daring! Now that you know the process you might ask what is it good for? It is simple, if you deposit money with Prepaid Profits, these scammers will get paid an affiliate commission from Banc de Binary for referring a new client. You see, scammers are making money as brokers’ affiliates, they get paid for every new person that deposits money with their broker through their app. This is why they can tell you lies about profitable trading software, because the moment you realise that their app is losing money, it is too late, they will already have earned their affiliate commission. Prepaid Profits is a scam that will force you to make a deposit with a broker that you cannot choose. Then it will lose your deposit. If you want to see how binary options really work and what you have to learn in order to make real money, try a free demo. There you don’t risk anything. In order to make money, you have to trade manually your profitable strategy, no free app will do that for you!